Springtime for hunters in America means largely one thing: It’s turkey time, which also means it’s time to get out the shotgun you probably haven’t touched for a while and brush up on your turkey calls. 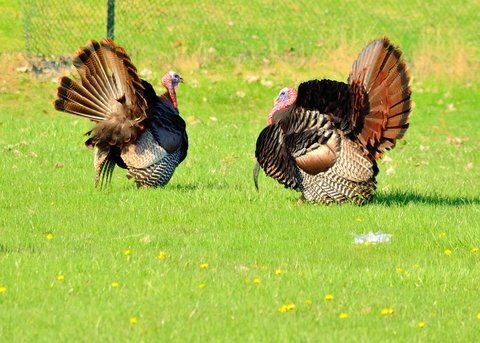 Here are five essential things you’ll need to know for a successful spring turkey hunt this season. The hardest part of any turkey hunt is finding the birds and locating land where you are permitted to shoot them. Property owned by a friend works great or your own property even better, but barring that you’ll have to check the laws and regulations in your state for available areas. Another option is to hire a guide, which takes all the guesswork out of the equation. With turkeys scent is not an issue, but concealment is everything. You should be wearing full camouflage including a ¾ face mask and gloves. You should even paint your face black or green to cover up any skin. Some hunters use ground cover but that may be too restrictive. Another great idea is to use the tail fan from your last kill to cover yourself as you make a final approach. Calling in the birds can be the most important and equally frustrating part of turkey hunting. First figure out where the birds are located, whether it’s in the roost (up in a tree) or on the ground. If there are no other hens around, the male is more likely to be on the move, but just how far he’s willing to travel will be hard to tell. Take into account the time of year whether you are hunting in early or late spring. The females would be worn out in the latter part of the season so adjust your cadence. Vary your calls going from crow calls, box calls, mouth calls and slate calls. And if you brought along a friend, practice calling back and forth to one another. Still having trouble drawing a bird out? Consider changing elevations. Decoys are essentials. Set up a couple in a clearing where you can sit back in the brush about 15 yards away and begin a series of calls. When a mature tom turkey catches the eye of one of those decoys, it will start to strut. Sometimes two males will quarrel over a decoy. Try throwing in a male decoy to increase tensions. Many adult males are known to get violent with those decoys. The most important thing during this time is that the birds have nearly complete tunnel vision making it the perfect time to take a shot. Here are decoy tricks you can use on your next hunt. While women and children might choose a 20-gauge, the 12-gauge shotgun is the most preferred gun turkey hunters. Many hunters also swear by #5 shot as it offers plenty of knockdown power. A gun with an open sight seems to work best as it allows the shooter to make a quick adjustment if needed. The best time to make a kill shot is when the turkey sticks its neck out. Aim for the lower part of its head and neck for the quickest, most humane kill. After the shot here’s a great resource for how to clean a bird without plucking its feathers.